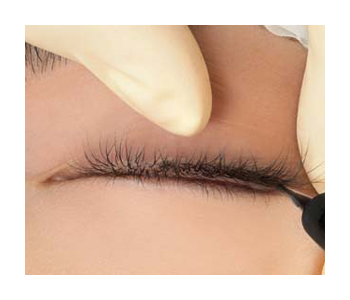 Lash enhancement is a permanent makeup treatment in which little dots of pigment are tattooed between your lashes, which will make your lash line look fuller. The little dots will form a line for which you can choose the shape and width. 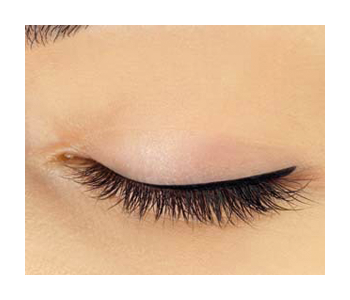 This permanent makeup on your lash line accentuates your eyes 24/7. It looks perfect under all circumstances, as it’s the only makeup that doesn’t run or smudge. Preparation and treatment takes about 90 minutes. A follow up treatment is required after 4 weeks and is included in the price, unless you are looking to change the shape or widen the eyeliner. Bring your own EMLA numbing cream. What are some of the advantages of permanent eyeliner? Permanent eyeliner is ideal for people who want expressive eyes without spending too much time on the daily application of makeup. People who want to spend less time in front of the mirror. People who play sports, swim, visit the sauna. People who are allergic or sensitive to makeup, and suffer from watery eyes. People who are not efficient in applying makeup, or people who wear glasses. What does the permanent eyeliner procedure involve? Eyeliner is carefully applied by a special little knife, which creates tiny scratches in which pigment is deposited. You can count on competent advice after we carefully listen to your wishes and expectations. We apply subtle permanent makeup that suits and complements your face, will not look obvious and will help you, with minimal effort, to look fabulous every day. Pigment is deposited just under your skin surface. Due to our extensive experience in the application of eyeliner, we are extremely skilled at creating the perfect eyeliner shape to suit your face, and avoid anything too obvious. We strive for the most flattering result.